In the opening scene of this video, which was shot on the final day of Baselworld 2018, I say to Felix, “We’re doing a list? !” with a type of delirious, high-pitched Seinfeldian disbelief. What I meant was, seriously, how could we be? We just arrived at Basel! How is it that we are distilling our fancied from the flock, already? What’s interesting is that the first impression favourites are usually quite accurate. When I look back at 2017 and 2016, the lists are still pretty spot on for my tastes. I even now own a few of them. However, what’s different this year is that I knew I’d picked one wrong watch almost as soon as we were out of my list and into Felix’s. I’ll get straight to it. The Tudor. I should have gone with my instincts and chosen the Fifty-Eight. The decision to go with the GMT though was not a frivolous one. It was a mental tussle that raged over the five days before we finally committed to our 10. It went something like this, with the angel being the Fifty-Eight, and devil being the GMT. Like always, the devil won, but it shouldn’t have. 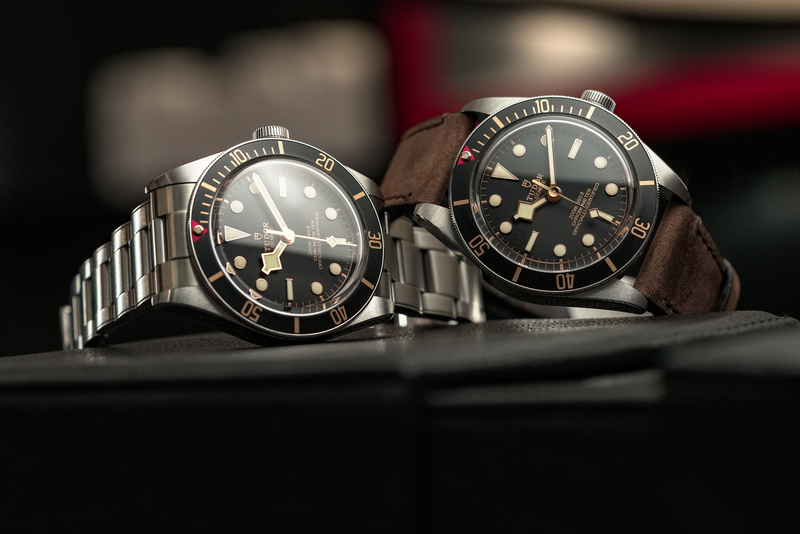 Devil: Choose the GMT, it’s the best looking Black Bay dial ever. Finally, all that space is taken up, and the little lume plots are divine. Angel: But the Fifty-Eight is finally the right Tudor case. It’s the first modern Tudor case to challenge an Oyster for comfort. That’s a big deal. Devil: Yes, comfortable, but from the front it’s the same look. Basically the same watch. Look at the GMT, the way the two colours on the matte bezel reference the BB Red and the BB Blue. That’s cool. Angel: I’m not sure. The slab sides. It’s still the same wrist feel, even if it does look more refined. That 39mm Fifty-Eight, it looks like the everyday wearer that could last with you through the youthful bigger wearing years into forever. Devil: Nope, the dial wins. After all, that’s what you look at all day. Devil wins argument. But with another week to process it, I’m giving the final decision to the Fifty-Eight. Despite continuing to heap the GMT dial and handset (that snowflake GMT hand) with glory, it in the end can’t compete with a watch that feels more ergonomic and ‘grown up’ on the wrist. By the way, please note: if I look high, it’s because I’m tired beyond any measure and propping myself up with more caffeine than the body was ever intended to handle. Hand on my palpitating heart, this video is brought to you by Nespresso only.